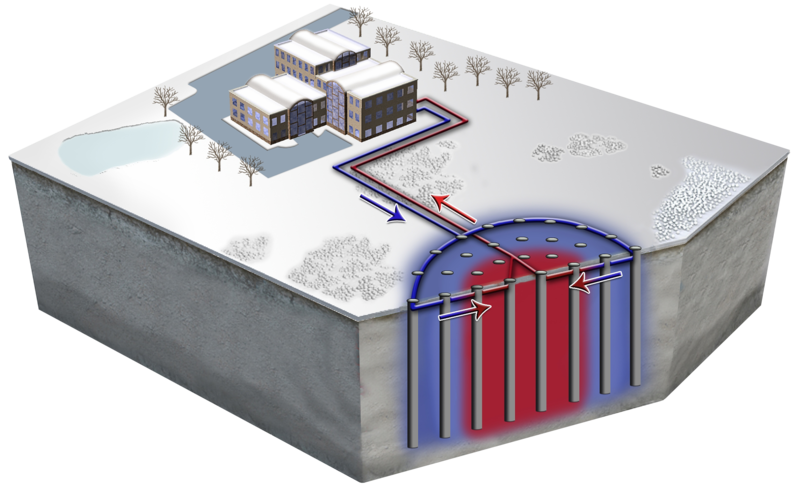 BTES is an improvement on conventional closed-loop ground source heat pump (GSHP) geothermal systems. The ground heat exchanger (GHX) array for a BTES system is designed and operated in a manner such heat is stored or abstracted seasonally, whereas conventional GSHP systems are designed to simply dissipate heat or cold into the subsurface. BTES essentially uses the Earth as a thermal battery, as opposed to a radiator. BTES typically involves design and operation of the GHX in a manner such that heat is sequentially built up in, or abstracted from, a cylindrical volume of soil or rock. This is accomplished by configuring the GHX array in a radial fashion, and reversing the flow direction seasonally. BTES can achieve coefficient of performance (COP) values from 4 to about 8, compared to COP values of around 3.5 for a conventional GSHP geothermal installation. Is BTES expensive? Difficult to permit? 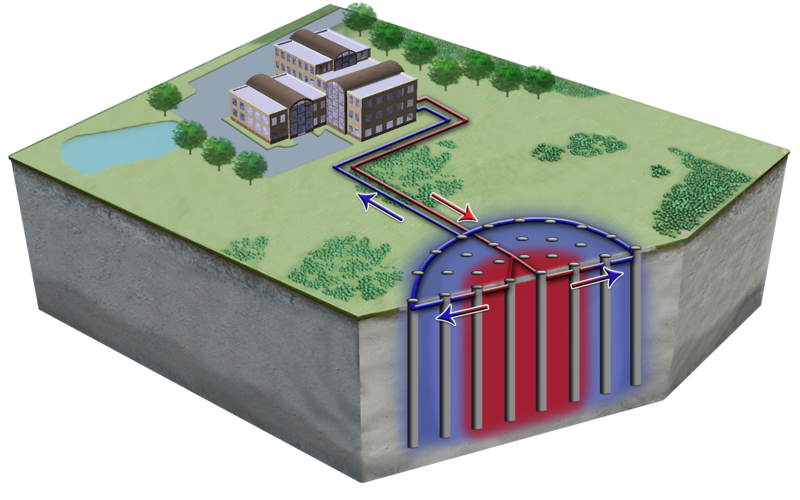 The capital cost of a large BTES system can be significant, as a large number of geothermal boreholes will need to be drilled, compared to just a few thermal wells for an ATES system. However, the installation cost should be similar to conventional GSHP systems, and the higher COP values will result in a lower total life-cycle cost than a conventional GSHP system. Both closed-loop geothermal systems will have a lower life-cycle cost than a conventional fossil-fuel fired HVAC system. Because BTES is a closed-loop geothermal technology, there should be little difficulty in obtaining permits. Typically, the most common constraint is on the available land area in which to construct the GHX array.